Maidenhead FC (founded 1870) and Maidenhead Norfolkians (founded 1894) amalgamated to form Maidenhead Town after WWI, with 'United' replacing 'Town' in the name from 1920. How exactly this equates to MUFC celebrating their 140th anniversary this year, I'm not too sure but - as it is - Oxford University will be the visitors to York Road on 15th March for a commemorative game. Now, there are far too many photos of me on Facebook, full stop. And in far too many of these I am wearing the same clothes; not least my 1970s Bristol Rovers shirt, or the 1978 Argentina replica that I purchased for my Diego Maradona-costume of Fancy Dress IX. As such, it's fair to say that I'm all for retro football shirts. However, calling a shirt 'retro' when it has a Nike logo emblazoned on it is rather laughable, methinks. I realise that the shirts are to be worn first - by those playing in the game - before being sold off and this presumably explains why they are manufactured by Nike rather than, for example, Toffs (polyester rather than cotton). And the ring-fenced ground fund is, of course, a worthy cause. But surely we could've sorted red and black hooped shirts that didn't have a prominent logo on them? 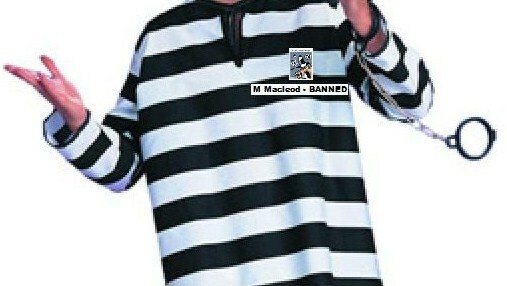 GMOSC are offering spectators (and any other non-interesting parties) the opportunity to acquire one of these shirts, post-Murdo's ban, by way of auctioning them via a sealed 'made up accusation' method. Your 'made up accusation' should be placed in a sealed envelope with your name, address and contact details and handed to the Yes Man of the Year (at the merchandise stall by Stripes) or Club Shop Guy (at the Magpies Megastore). The closing date for bids is Tuesday 15th March 2011 and the minimum 'made up accusation' for a shirt is "attempting to bring alcohol into the ground". Please note that in the event of a tied bid, misspellings will be looked upon favorably. The decision of GMOSC is final and may be totally contrary to the submissions received. Correspondence is welcomed but will not be replied to. Good luck and happy smearing!